Vegan Hibachi Soup Recipe with the homemade vegetable stalk. Very healthy, nutritious and best for all ages right from the toddlers to the old people. Tastes heartwarming, soothing, and simple. Best to be served before meals and can also be served as a midday meal. 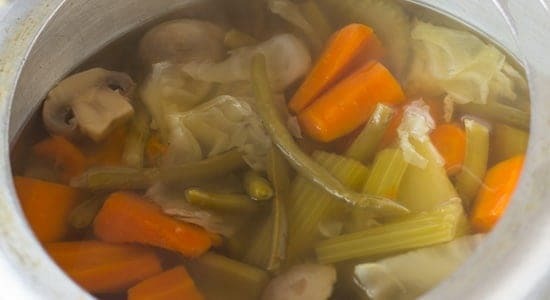 Making Hibachi soup recipe at home is not only cost-effective but also makes us feel great by serving good food to our family. Few in my family are not great lovers of vegetables and they choose to avoid them though they are healthy and tasty. And this soup is perfect for both vegetable lovers and non-lovers. 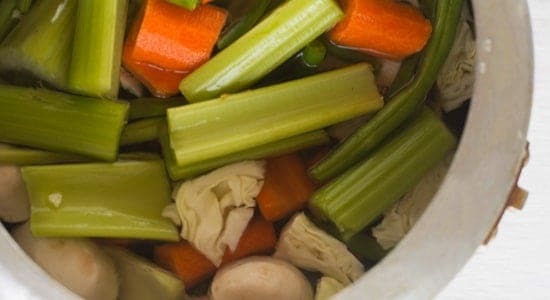 Though the commercial vegetable broth tastes great, I generally avoid and choose to make the vegetable broth from the scratch at home. 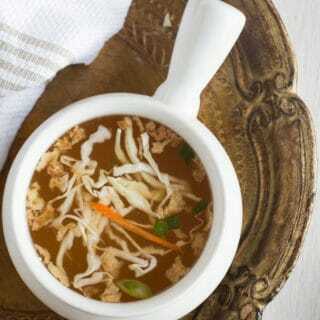 If time does not permit to make your own vegetable broth, you may use ready-made vegetable broth as well. But I would strongly recommend making at home. And making at home is not that tedious job. All you need is fresh vegetables and that’s it. Sooner I will come up with the separate post for making vegetable broth both with pressure cooker and slow cooker methods. Today I made vegetable broth with the pressure cooker. And it took around minutes to 30 minutes to extract vegetable broth. And the experts suggest pressure cooking method retain all the nutrient values of the vegetables. If you are searching for other easy to make Chinese recipes, look into Tofu Steak, Teriyaki Chicken, Best Chinese Green Bean Salad. 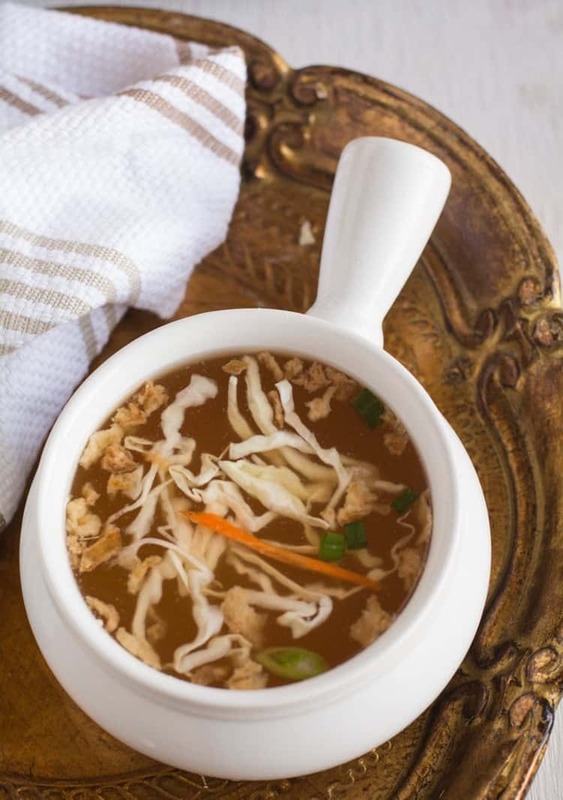 You may use either store-bought vegetable broth or homemade. Both tastes equally good. You may use any kind of vegetables for making the broth. Using seasonal and local vegetables is not only healthy but cost-saving factor as well. Add water for about 2/3 level of a pressure cooker, but later you may add water as per your requirement. In the pressure cooker, add all the cut vegetables and water for about 2/3 level of the pressure cooker. After 2 whistles keep the flame in simmer and cook for about 25 minutes. Let the pressure cooker cooled down for 10-15 minutes. Open lid strain and reserve the liquid. In the serving bowl, add this liquid, salt and pepper, a tablespoon of shredded cabbage and fried onion and serve hot. 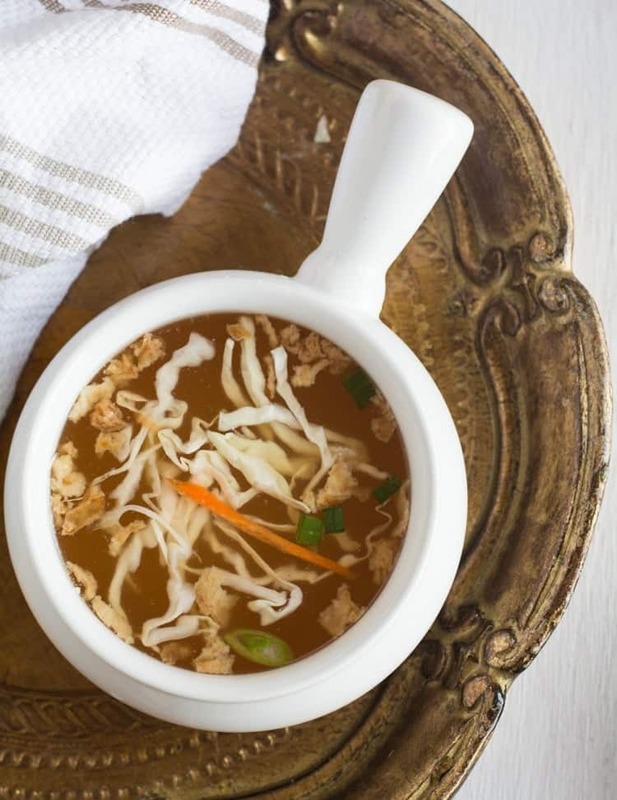 Vegan Hibachi Soup recipe is easy to make at home with vegetable broth and fresh vegetables. Very healthy, low carb, gluten free which is best for all ages. Roughly chop all the vegetables. Reserve 1/2 cup of thinly sliced cabbage, carrot for later use. In the pressure cooker add chopped vegetables. Fill 2/3 of the pressure cooker with water. In the high flame, cover the lid and cook for 2 whistles. Then simmer the flame, cook for about 25 minutes. Let the pressure cooker to cooled down for 10 minutes. Open the lid, and strain the liquid. Transfer this to serving soup bowls. Add freshly shredded cabbage, carrot, and fried onions. 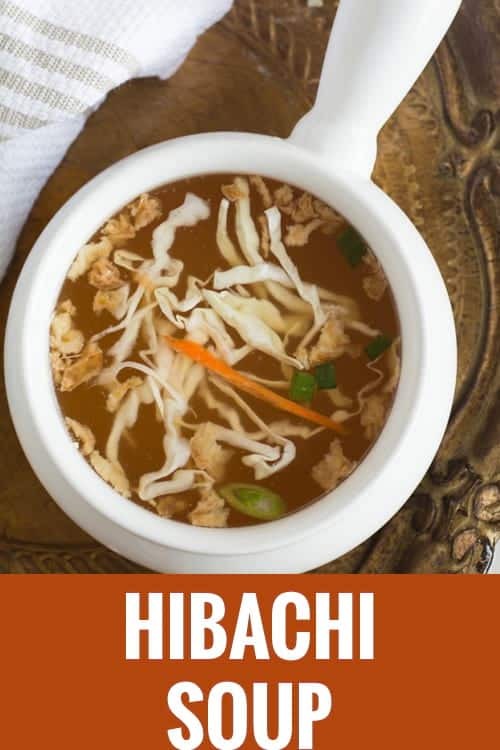 And serve hibachi soup hot.